Love those mushrooms. I just received my first Unity set I might find sometime to play today! Love the ribbon Carole, this rocks! Oh, I just love your card!!! Fabu! see you over at SCS! LOVE this! Love the purple you have used! Awesome card! LOve the purple and green mushrooms! Rockin' case Carole! totally CUTE Carole!!! great job! These are both too adorable!! I'm loving those mushrooms. Super cards. Great choice! I love that card- and your version is beautiful! Adorable! 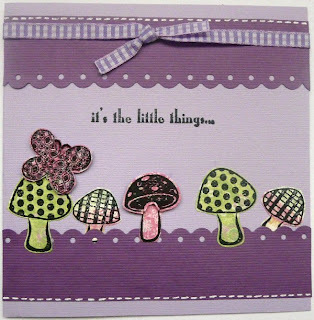 Love how you stamped the mushrooms on the patterned paper--so fun. 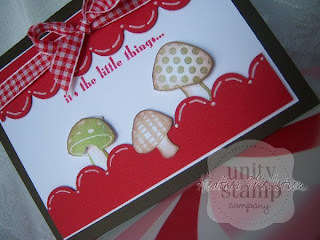 I love the red one, and the mushrooms are so cute!! Great job! OMG Carole those 'shrooms are fabulous!! I especially love the red one!